Hi, everyone. This is Dr. Reed Storme again. I hadn't intended to blog here this month but I was concerned enough about someone that I asked to do so. That person is Carrie Kennersly, a veterinary technician who works part-time at the Knobcone Heights Veterinary Clinic, where I'm a veterinarian. She also owns two bake shops here in town, Icing on the Cake, where she sells baked goods for people, and Barkery and Biscuits next door, where she sells dog treats made from recipes she mostly developed while at our clinic. And why am I concerned about her? Well, I do care about her. We seem to be developing a romantic relationship, but even if we weren't I'd want her to be safe. But lately she's been sticking her lovely nose into situations that shouldn't concern her. She's becoming an amateur sleuth. Oh, I certainly understood that when she was the primary suspect in the murder of a rather nasty woman who was giving Carrie a hard time a while ago. And even somewhat when her brother's girlfriend was considered a suspect in another situation. But here we are, with her involved in solving the third murder in town in a matter of months. And this time she tries to help Jack Loroco, a guy suspected of killing a coworker in VimPets, the pet products company for which he works--an acquaintance of Carrie's, but not a very close friend. That story is now described in a book called BAD TO THE BONE. In it, I tell Carrie often to back off--or at least be careful so she won't be hurt. Does she listen to me? Well, sort of. She definitely takes orders from me when I'm acting in the capacity of a vet telling a vet tech what to do. But as an amateur investigator? 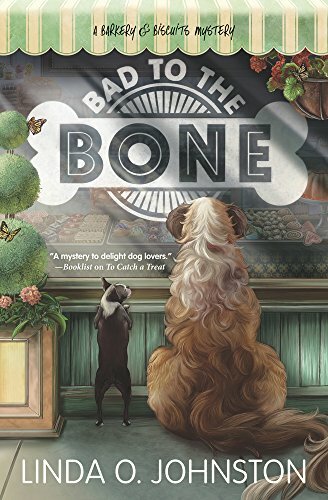 BAD TO THE BONE, the third Barkery & Biscuits Mystery by Linda O. Johnston, is a May 2017 release from Midnight Ink. What a cute idea, for a blog!!!!!! I am leaving a click-able link, to here, in my post today.